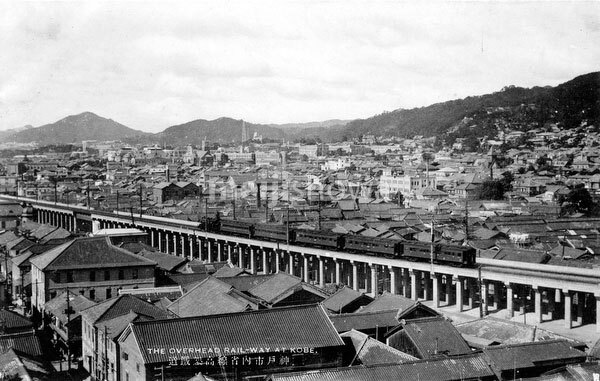 A steam locomotive pulls passenger cars on elevated railway tracks in Kobe. The tracks were elevated in October 1931. During WWII the area below the tracks serviced as a welcome shelter for countless people who lost their homes to fire bomb raids. The mountain on the far left is Takatoriyama, which has a Shinto shrine that offers an amazing view of Kobe, its harbor and Osaka Bay. See blog entry.